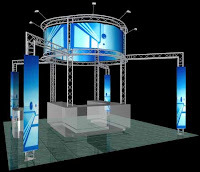 DisplaysExhibits.com - Lighting Truss and Exhibit Displays: New and Exciting Design Ideas for Trade Shows! New and Exciting Design Ideas for Trade Shows! Tired of the same old trade show booths? Do you need to get more bang for your buck? We have what you need! Get a lifetime warranty using heavy duty products for the same price as cheaply made plastic and lightweight booths. Milos QuickTruss is definitely the way to go and DisplaysExhibits.com can help you with that goal! Check out our exciting pre-configured design ideas or createyour own masterpiece! Visit us at http://www.displaysexhibits.com/ or call us at 888-804-0042!